When I signed up in March and picked a goal, I chose $5,000 because that felt like the least I could aim for, given the severity of the crisis we’re facing. It was big enough to scare me into action – I made a lot of phone calls, printed free (and slightly tacky) business cards, and set my targets on raising $500 per week. There were moments when I thought $5k was totally out of reach. But every weekend a few unexpected people showed up, a few hopefuls followed through, and as they say in Spanish, poco a poco, se va lejos. Then, after A’s swim lesson on Saturday, Team Tracey – Grandma, Grandpa, A and myself – loaded up into the rental car and started driving north. We didn’t quite get to Gilman Street (about 3 miles up the freeway) before my cell phone rang. Peter had left his wallet in the diaper bag. So we turned around, and came back home, by which point A was fast asleep in her car seat. That made the first half of the drive pretty simple. We met up with the Climate Ride bus caravan in Hopland for lunch at the Solar Living Center and then made a second stop at the really great public playground in Willits. After that, it was a couple hours of repeatedly reading the same few books and singing songs to get to Fortuna. Thank goodness we didn’t have to go all the way up to Arcata! A couple of friends met us in Fortuna to say hello – we took a walk with Annie Dog by the Eel River, and had dinner with Jen at the Eel River Brewery – and then snuggled down in the Super 8 next door to the brewery for our first night away. The next morning, I was scheduled to be on the road at 9:00 a.m. Little A woke us all up around 6:30 a.m. as usual, but this morning she spent about 5 minutes crying, “Papa, papa” before she really woke up. She missed her papa! Around 7:45 a.m. I said goodbye at the hotel. Despite showing affection toward Grandma and Grandpa – even giving them goodbye kisses Friday night – she melted down. I walked over to the camp where the ride was set to begin and called Peter on the way to report out, since I wasn’t sure what the reception would be like along the route (answer: horrible, T-Mobile is not your friend on the north coast). I’m pretty sure he was still expecting to have to rent another car and come rescue her within 24 hours. But I had high hopes and soon, I was with my teammates listening to the safety talk and couldn’t do anything about it anyway. We posed for a photo with the sign that read “San Francisco – 320 miles” and then we were off! Our first turn was a right onto the freeway – which, after 3 years commuting on the 101, wasn’t a shocker to me, but my teammates were kind of floored to steer their bikes down a freeway onramp. Heh heh, welcome to rural living. 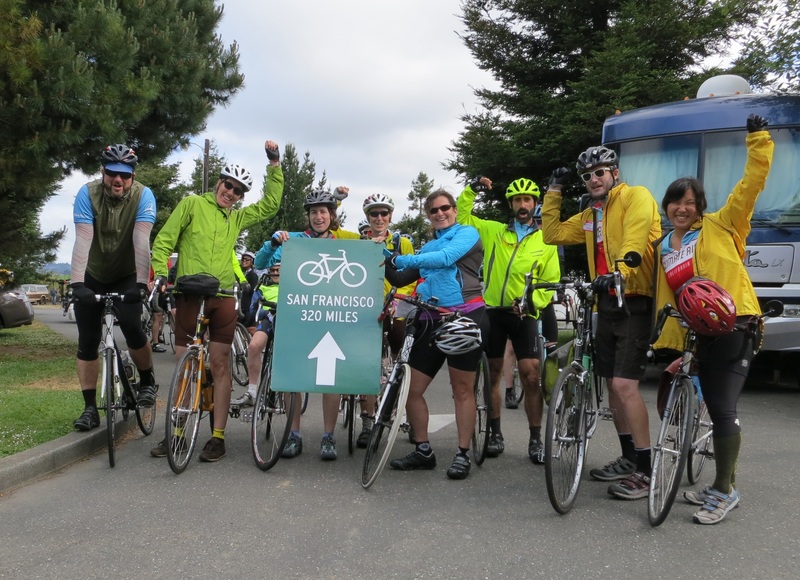 The Climate Ride crew had found as many alternative routes as possible to keep us off the freeway. 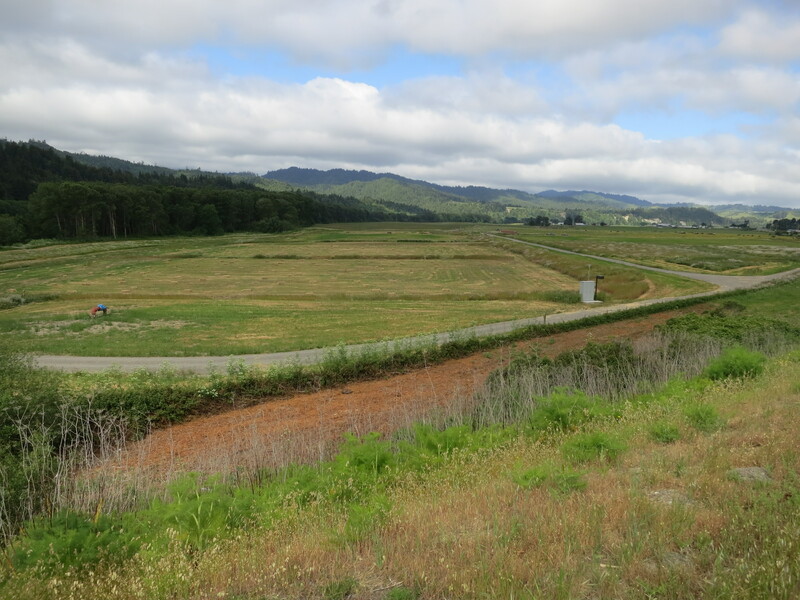 Some of them – like Chapman Road, a detour to a cowfield along a semi-paved road spattered with cow pies – I could have skipped, although no matter what the road surface was like the beauty of the Eel River flats was breathtaking. I have driven south so many times along this stretch, but I don’t think I’ve ever noticed the steepness of the forest-covered hills as I did on my bike that day. It was a lovely foggy morning. I truly miss living in Humboldt County. After the first hour or so we were in Scotia for a water break at the railroad/logging museum, more memories there – the day that the Humboldt Redwoods Company painted over the words “Pacific Lumber Company” on the side of the old Palco building, I was driving a friend’s pickup truck south to visit Peter in Oakland. I still wish I’d stopped to take a photo of the “-acific Lumber Company” letters. So much history there. After a quick break and a moment to admire a hand-carved front-loader, I was back on the road. Soon, we exited the freeway for the Avenue of the Giants. Hello, giant redwood trees, God sunbeams shining through your branches, trillium and sorrel tickling your roots. I lost my teammates completely here, just hitting my stride through the ancient forests and “floating” up and down the gentle rises. I saw some folks stop to take a photo of hugging a tree. As when I’m hiking, I found it difficult to stop and check out anything in particular – the sensation of moving through the landscape is what fuels me. Our lunch stop came too soon, but did offer a chance to hunker down under some big trees for a while and put my feet on the moss carpeting of the forest. And eat some Nutella. Yum. Lunchtime among the big trees. After lunch the incredible rolling redwood experience continued for a while, just incredible. Then we were back on the 101 near Benbow, then off again to explore some rustic back roads before our final water stop in Redway. Next time they should schedule some air time with KMUD! But Signature Coffee was open especially for us on a Sunday afternoon and I got a little ice coffee boost before continuing on through Garberville. As I approached, I realized I’d never ridden a bike through Garberville (or Redway, for that matter) and how funny it seemed to be so familiar with a stretch of road that I’ve not pedaled. 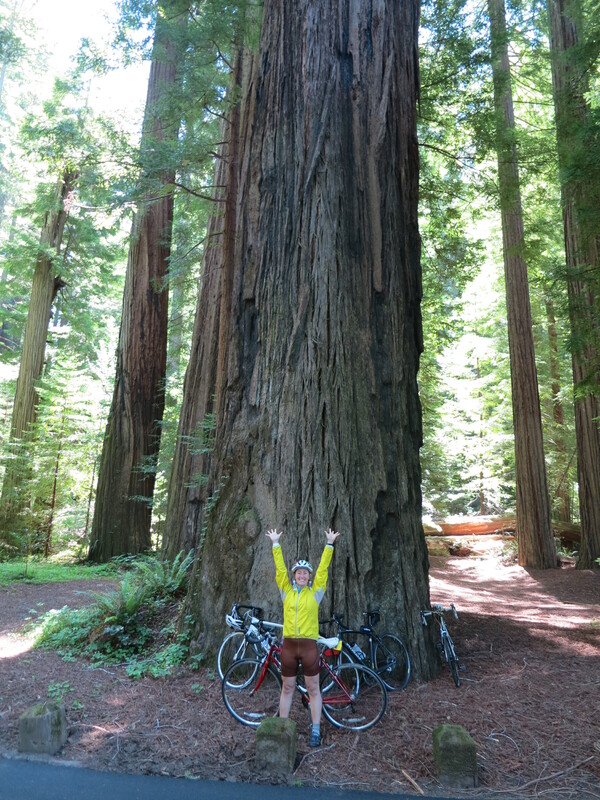 Not exactly a short jaunt from Arcata, and not exactly a critical biking destination on its own – so I really appreciated the opportunity to ride through town. I didn’t have time to stop at Chatauqua Natural Foods, but I sent my parents there for snacks for little A. Finally, back on the 101 for the final stretch to Richardson Grove. Sniff sniff as I rode over the new Confusion Hill bridge (okay, probably not so new anymore to folks who still live up here) – so crazy to look left and see the old 101 finally allowed to make its long-desired slide down the hillside. There’s something unique and incredible, if inconvenient and potentially dangerous, about living in a place where all roads to the outside are impassible sometimes. The new bridge made Humboldt a little less wild. And I wish I’d gotten to ride the old road before it crumbled into the river. I had agreed on a 4:00 p.m. meeting time with my parents, and it looked like I’d be arriving about 10 minutes early – hopefully soon enough to jump in the shower before they got there, because I knew that once A saw me there would be no escaping. Alas, they were waiting in the playground beside the campground driveway. But luckily, they had had a pretty good day. Some fussing for sure, but she was distractable. I decided to try to escape for a shower anyway, and she howled again, so I took a really quick shower while Grandma and Grandpa tried to distract her for snacks. Then I came back and she practically glued herself to me. We made sure my parents were all set with a cabin for the night, and then set up home sweet tent. A was in charge of holding the stakes. She was excited, even though it’s been months since we’ve gone camping. That’s my girl! My parents set off to find themselves some dinner and I fed A her leftovers from the night before, then some of my dinner. She made some friends of other riders – so long as she was sitting on my lap – and then fell asleep super quickly in the tent. I snuck out to catch the very end of the evening program, but after one conversation I was wiped and followed her to sleep. Day 1, complete. Hey there! It’s been awhile since I’ve checked in here, but even longer since you’ve posted some of your amazing words. Any time to write a bit again this winter? It fun getting to see you on FB, but also enjoy this piece of your life. Cheers from New Hampshire!